WASHINGTON, Oct 1 2013 (IPS) - With a key U.S.-Africa trade agreement up for renewal in 2015, advocates on all sides of the issue say current policies are rife with shortcomings that leave many African businesses out in the cold. Since its enactment in 2000, the African Growth and Opportunity Act (AGOA) has sought to create trade opportunities for small- and medium-sized African businesses by helping them export their products to the U.S. market. But policymakers and activists alike are currently increasing focus on AGOA’s failures at empowering Africa’s poorer communities, and whether the act can be tweaked by 2015. And while U.S. exports to Africa have tripled over the last decade, “only as little as 1.3 million jobs have been created on the African continent since the enactment of AGOA,” Ambassador Michael Froman, the U.S. trade representative, recently warned. One of the obstacles to a truly successful outcome for AGOA has been its focus on only some sectors of the economy – including oil exports – to the detriment of those sectors with a more immediate impact on poorer segments of society. That includes the agricultural sector, the single most important for African communities. So far, agricultural products have been excluded from the AGOA framework because of U.S. domestic regulations. This seems to be the biggest bump on AGOA’s road to decreasing poverty in Africa. According to recent estimates, oil exports cover nearly 90 percent of goods leaving African shores. 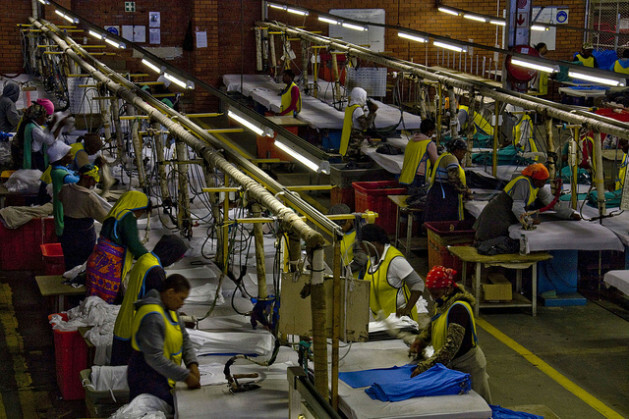 At the same time, AGOA has managed to open the U.S. market to the growing African textile industry. Many are today touting as a key AGOA success story the recent boom in Kenyan textile exports to the United States, to companies such as Victoria’s Secret and Macy’s. According to the most recent estimates, Kenya was the United States’ 103rd-largest supplier in 2011, with a total of 382 million dollars’ worth of imported goods, a nearly 23 percent percent increase from 2010. USADF offers development grants to small African businesses seeking to access the U.S. market. Berenbach says such opportunities can have a direct impact on poverty. “Most of the work in Africa is about dealing with the weakest part of the African economy, the impoverished communities,” she says. As the bill is set to expire, a broad cross-section of interests are looking to 2015 and providing recommendations on how to improve AGOA. They suggest that the bill’s ineffectiveness to date may not be entirely a result of hidden trade barriers. “AGOA can’t reach those many African communities that aren’t involved in the production process, simply because of domestic restrictions and a lack of adequate infrastructure,” Mwangi S. Kimenyi, the director of the Africa Growth Initiative at the Brookings Institution here, told IPS. A recent poll by Afrobarometer, an independent research organisation, finds that almost half of Africans still perceive themselves as being poor. Based on polls conducted in 34 countries, the survey shows that at least 20 percent of Africans still feel deprivation with respect to their most basic needs such as food, water and medicines. One way to do address this, some suggest, would be to include a provision in the next version of AGOA that would provide assistance to small-scale African traders to build their skills at dealing with international trade concerns. USADF’s Berenbach calls this a “trade capacity-building”, or TCB, component. “Including a strong TCB component would enable even the smaller producers to be more productive and trade effectively, so that we can really use trade to achieve development,” she says. At the same time, Brookings’s Kimenyi notes that many see AGOA as doing very little for U.S. companies seeking to invest in Africa. Many corporate interests will thus be looking to the debate leading up to the 2015 renewal as an opportunity to change this aspect of the trade agreement.